Sports Betting Tips for Beginners - Start betting with tips from our Experts! Every year the Sports betting market gets bigger and bigger. More and more consumers decide to try some online sports betting. And why not? It is fun, it is easy and when you are good at it (or lucky) you can win some money with it. Personally I like sports betting because it makes watching sports even better. When I am going to watch a game I place a little bet on the game. A bet makes the game better to watch and more exciting. When you search the internet for suppliers of sports betting, you will find hundreds of different bookmakers. I can understand that it is hard for you to choose an interesting bookmaker when you are a beginner. And how can you place the bets? On this page I am going to give you a fw sports betting tips for beginners and you can also find more information about a few of my favorite bookmakers. Step by Step I am going to take you through the online sports betting world. I am using example movies and a few of my favorite bookmakers to guide you through the world of Sports betting. Maybe you already placed some bets at land-based bookmaker offices or at friends in your home town. Online sports betting is not the same because at online bookmakers there are a lot more betting options waiting for you. At major sport events you can sometimes place up to 250 different kinds of bets on just 1 single match. In the past the betting options where a lot smaller. You could place a win, a draw or a lose. But now you can bet on first half winners, score predictions, handicap bets, goal scorers, injuries, fouls and loads of more crazy kinds of bets. It is wise to do some research before you start placing bets. Check how the different kinds of bet work and what the chances are of winning a certain bet. Before you start playing at an online bookmaker it is very important to be sure that you only play with money you can miss. Never play with money you need for your daily life. This is money you need to buy food, insurance and to pay your living. Always bet responsible because betting is very addictive and a lot of people are emotional betters (betting on their favorite team, or against teams they hate). When you are 100% sure you want to start betting on sports it is time to choose a first bookmaker. You can only place bets at sports events when you have a verified account at a legal online bookmaker. On our website you find a selected amount of legal bookmakers. 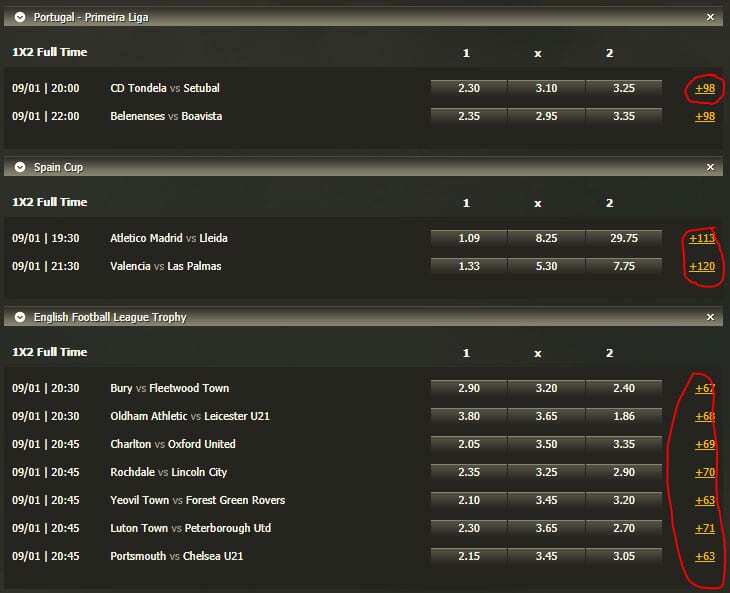 We added these bookmakers because they are 100% safe and reliable and they all offer you an interesting bonus when you join them. Signing up a at a bookmaker is always free of charge and it is very easy. For this blog I decided to sign up at Bethard because this bookmaker accepts players living in the Netherlands. One of the most important Sports betting tips for beginners would be “Claim the welcome bonus when you join a new bookmaker”. As you can see in the above table, you can collect interesting welcome bonuses when you join the bookmakers/ casinos. I always recommend to use this bonus when you are a new to the world of sports betting. With the welcome bonus you are able to collect extra play money on top of your first deposit amount. As you can see Bethard offers you 200% bonus up to €100 when you make a first real money deposit. So when you deposit €50 you receive €150 to play with. Making a first real money deposit at an online bookmakers is actually very easy. Simply follow the underneath steps and you are up and running and ready to bet within a few minutes. Ok now it is time to start placing bets at sports event and matches. I prefer to bet on football matches because football is my favorite sport and I think my knowledge for this sport is much better than for other sports. So in my video example I am going to place a bet on a few football matches. After I logged in to my Bethard account and made a €25 deposit I am ready to place a few bets. As you can see in the video I decided to make a few simple bets. To make things easy I did not made comprehensive bets in this example. This night Nice plays against Monaco in the French League Cup. Nice plays at home and they host a well playing Monaco. That is why the odds on Nice are higher than the odds on a Monaco win. My feeling says Nice is going to win this game because it is a cup match and Nice plays at home. I get 3,30 times my bet amount when Nice wins. I placed a €2,50 bet. So when Nice wins within 90 minutes I win 3,30 x €2,50 = €8,25. A cheap and fun bet to start with because I am going to watch this game on the TV. My 2nd bet is a lower cup bet in England. Bury plays at home against Fleetwood Town. Fleetwood town is playing very well at the moment and Bury is losing allmost every game they play. In my opinion a nice bet to add to my bet slip. when Fleetwood town manage to win this game I win 2,40 times my 5 bet. So I win €12 when I am lucky. Cards – How many cards? Who will get booked? Periods – When will the goals be scored? Are there goals in a certain period? Under – Over bets – Less or more than 2.5 goals in a match? Specials – Who will get booked? Are there any players getting injured? Tournament bets – who will win the tournament? Who is going to be topscorer? At bookmakers you find the extra and special bets behind the sport event of your choice. See red marked spots in the underneath screen. When you click at the numbers behind a bet the extra betting section of that certain event will open for you. The number tells you how many extra bet options you can choose from. When you decide to click on the +113 behind the Atletico – Madrid – Lleida game you will find 113 extra bet options. Underneath you can see which other betting options you can choose from for this game. As you can see you can bet on Goals, Halves, Corners, Specials, Cards and Periods. Decimal odds look like this 1,20 – 2,00 or 3,00. And in my opinion the decimal odds are the easiest around because you simply multiply your bet amount with the odd. A simple example of the Atletico – Lleida game from the above screen. When you bet €10 on a win for Atletico Madrid you receive €10 x 1,09 when Atletico wins. So you receive €10,90 after the game. When you bet €10 on a draw and the match ends in a draw after 90 minutes you receive €10 x 8,25 = €82,50 in your betting account. Fractional odds are used for betting in the UK and in Ireland. And in my opinion they are a bit more comprehensive than the decimal odds. But maybe that is because I am used to decimal odds. Ok let me explain the fractional odds for the Atletico – Lleida match. When you bet on a win for Atletico you get €2 for every €25 you bet. So when you bet €50 on Atletico Madrid you receive €2 profit (Total of €52) when this team wins. When you bet on Lleide to win you receive €28 for every euro you bet. So when you bet €10 and Lleida wins you receive €10 x 28 = €280 in your sports betting account. Sports betting tips for beginners – My personal tips! I hope my sports betting tips for beginners helped you to start making a few winning bets. If not I recommend you to check out the underneath summary of tips for beginners. With the tips you are up and running within a few minutes and you are ready to place a few bets at safe and reliable bookmakers. Use an available bonus when you register at an online bookmaker. With the bonuses you can collect more betting money. 99% of the Sports betting websites offer you a platform you can use on a computer, a tablet or on your mobile phone. Their websites are responsive and that makes it easy to place bets on any device with an internet connection. You only need to open the sports betting website and it will response to the device you are using. A few bookmakers also offer a mobile app that you can use to bet on sports. A mobile app makes more easy to bet on a mobile phone or tablet. Most online bookmakers also offer a casino section on their website. This is fun because you can play a lot of different casino games and video slot games with your winnings. You only need one single account to play casino games and bet on sports. If you only want to try a few online casino games I recommend you to join one of the underneath casinos because they offer you €10 free play money when you join them.